Today, May 25, is the 14th Towel Day. A day when Douglas Adams fans celebrate his life, work and untimely death. It was first proposed in 2001, just a few days after his death. A celebration in a very Hitch Hiker tradition of silliness. The day has no connection to the great man. When the idea was first started, the internet was asked and today was the winner. A better day could have been the 42nd day of the year or 42 days after his death. His birthday was another day suggested but ultimately rejected. Today was selected basically because it was close enough to Douglas’ death and far enough away so the first celebrations could be organised. The celebration is simple. Just carry a towel and be a hoopy frood. Someone who knows where his towel is! It started out small and over the years it’s not only Douglas fans that have got evolved in events. The Norwegian public transport company, Kolumbus, helped the impoverished hitch hiker by giving away a limited number of towels. These contained a RFID tag that gave the owner a free journey on any method of public transport for the day. The same year, 2013, the Chevy Chase branch of DC public library offered a special prize for anyone who wore a towel on the day. There maybe an event to celebrate this great day near you. 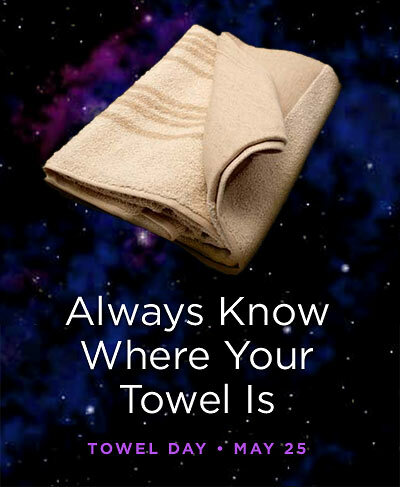 Just head over to the towel day website and check. You can always run one if there isn’t one nearby. There are events all around the world. From Argentina to the United States. Please tweet what you are doing. Use the towelday hashtag to mark your participation and towel-love. Either that or just follow @towelday on twitter. They do have facebook page as well. I leave you with what Douglas wrote about the towel in Hitch Hikers Guide to the Galaxy.